A mobile and committed presence, Waratahs prop Benn Robinson is a good example of the modern front-row forward. He made his international debut against South Africa in 2006, a year after he came on to the Super Rugby scene with New South Wales. Alongside Al Baxter and Stephen Moore he helped to shore up the previously suspect Australian scrum under the guidance of coach Robbie Deans. His athletic work in the loose is a regular boost to the Waratahs and Wallabies, and he has committed himself to the Australian Rugby Union until 2010. 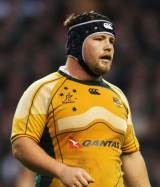 Robinson was set to be a key part of the Wallabies side in the 2011 Rugby World Cup but unfortunately for him and his country, Robinson was ruled out for nine months in July 2011 with a torn cruciate ligament.